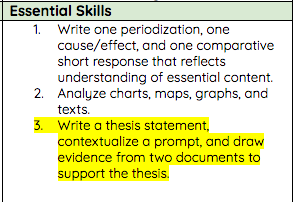 My skill instructional goal was centered around the document based question. Also, I tested the students on last weeks skills, just the thesis and contextualization to see the retention of their abilities. Throughout the week, the students analyzed documents and more documents. And more documents. By the end of the week, they were able to pull evidence from a document and connect it to their thesis. It was great! The students dove into the documents and were able to write out their understandings. Check out the video below! On the content side of things, there were numerous checks for understanding on the content. I know and the students know what they know and don't know. These checks were crucial. Additionally, I did a thesis skill check to monitor progress from the week before in order to see if they had retained mastery. I gave the students and unannounced prompt to see if students could still write a strong thesis independently without support in the same way they will need to do on the AP exam. This thesis check proved my instruction and their reflection from last week were inadequate. Many students did not master the thesis and contextualization skills. Their responses demonstrated that they were not at the level I thought they had achieved. nor at the level they thought they had attained, based on last week's progress. Some responses were not clear, revealing potential confusion. Other responses were missing components or were contradictory. Well, I know the content checks are working. They are acing the checks for understanding. There are a few students that need to go back to review previous knowledge, but overall they have made strides in knowing what they don't know, and articulating it to others. I notice this in their peer-to-peer feedback conversations and their conversations with me. In the past, it was a quagmire trying to figure out what students need to work on. 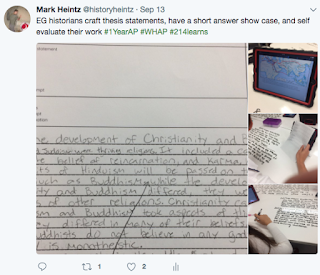 This year, some of my revised and varied formative checks for understanding have allowed me to better point my students directly to what they need work on to help them master the content. From the checks I did this week, I figured out that many of them had the same gaps in knowledge and I was able to to address those common gaps to the whole class. The students were amazing with they beginning document work! However, I don't believe they have any idea what they are doing. Sure, they can analyze the document and link it to a thesis statement when I am present and walking them through the steps. But I don't think they can do it alone nor do I believe they actually know where these scaffolded steps fit in the big picture. That was a big pause for me. I realized that I kept having them go through the steps, but I never had them pause to reflect on what and why they were doing it. It was as if I was driving it, and they were on the path of learning with me, but they couldn't get to the destination on their own yet. The final one really knocked me off my feet. The previous week's instruction told me they were ready to move on. The feedback they gave me, told me they were ready to move on. However, the results did not match this feeling. When it mattered, on their own, they couldn't preform. I need to go back and look at what I did, and maybe try a different strategy. 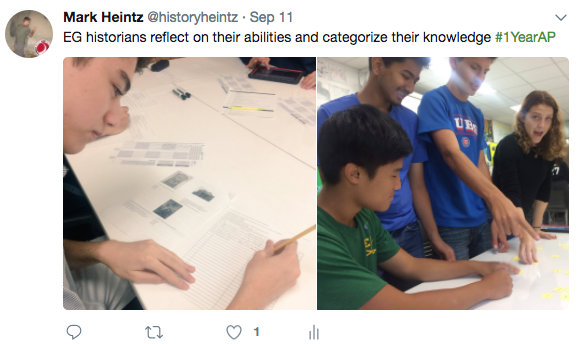 I need to have more moments in the class where they are given the opportunity to respond and demonstrate their learning without support, in much the same way that they will have to do under the conditions of the AP test in May. I need to give them more moments where they are given a prompt they have never seen before and are working through it. The reflection is going great, but I need them to reflect more on how they did under the specific conditions of the assessment.